The human nervous system is an extensive network of specialized cells that allow us to perceive, understand and act on the world around us. Much of the executive activity occurs in the brain, while the spinal cord mostly acts as an information highway to connect the brain to many cells throughout the body. Electrochemical signals connect the circuitry of the body and the brain, allowing for bidirectional signaling. The nervous system is separated in two classes: the central and peripheral nervous systems. The CNS consists of the brain and the spinal cord. Both are made of soft delicate tissue protected by the skull and spinal vertebrae. 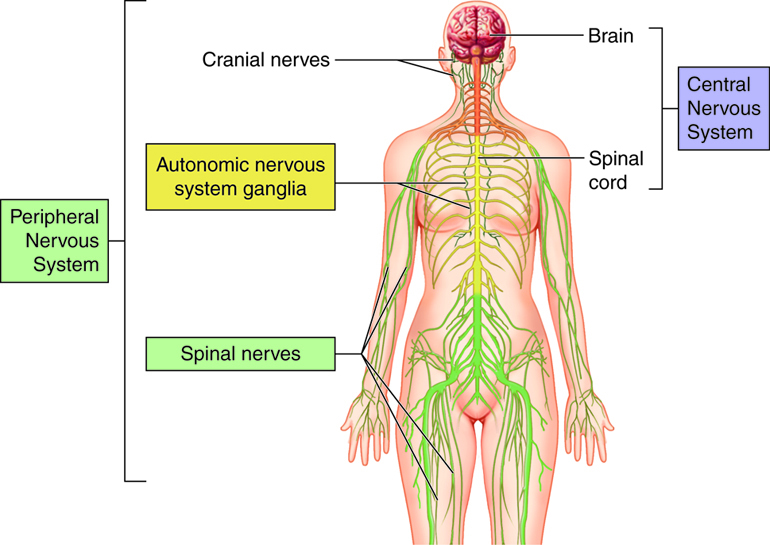 The CNS acts as the control centre, using neurons to send and receive information to and from muscles, glands, organs and others systems in the body primarily through the Peripheral Nervous System. Between the brain and its blood supply is the blood brain barrier. As its name suggests, the blood brain brain barrier prevents the transfer of non-lipid soluble molecules, which may include toxic molecules. It does however allow the transfer of beneficial molecules such as amino acids and glucose into the CNS. A related example would be the manufacture of L-Dopa, a man-made version of the neurotransmitter dopamine which is used as treatment for Alzheimer’s disease. The reason why patients are not simply given dopamine is that dopamine itself is not able to cross the blood brain barrier. The PNS acts as a relay, transmitting information between the CNS and the rest of the body. Unlike the CNS, the PNS is not protected by the vertebral column and skull, or by the blood–brain barrier, which leaves it more exposed to toxins and mechanical injuries. The PNS contains neurons that junction with the CNS and have long axons that extend to all parts of the body. These axons are referred to as nerves. In contrast with CNS neurons, PNS neurons are able to regenerate. Consequently, the properties of the PNS have been studied in regenerative research1. Sōma means ‘body’ in Greek so somatic means relating to the body. The somatic system relays information about most of the body’s conscious activity to and from the CNS. The somatic sensory receptors receive information from the senses and send it to the CNS while the somatic motor division sends information from the CNS to control the actions of the skeletal muscles. The autonomic nervous system primarily regulates involuntary or unconscious activity such as heart rate, breathing, pupil dilation, regulating glands and internal organs, blood pressure, digestion, and many other chemical processes that keep our body working. 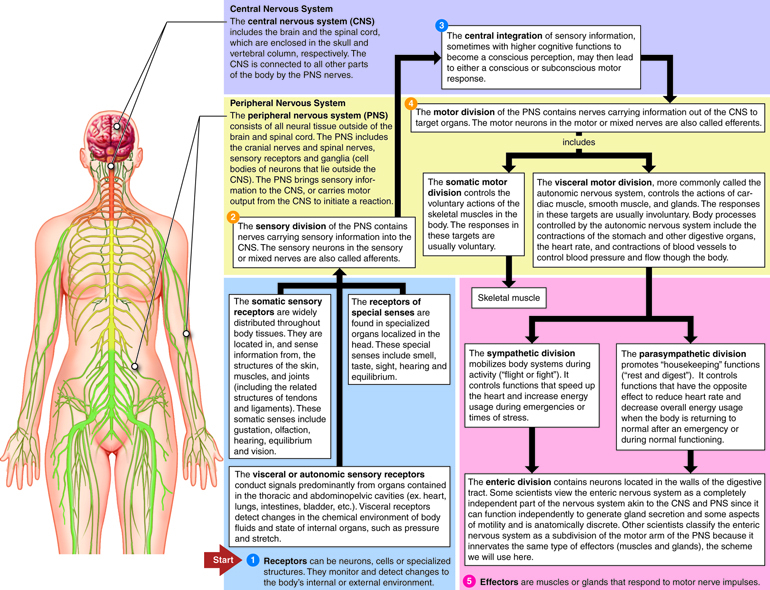 The autonomic sensory receptors receive information from these systems and send it to the CNS while the autonomic motor division sends information from the CNS to these systems. Although the word autonomic (from autonomy) means involuntary or unconscious, some of these activities are perceived and can be controlled consciously. The autonomic motor division is divided into two complementary subsystems: the sympathetic system, which works to shift the body into more prepared states; and the parasympathetic system, which facilitates more relaxed states. The constant shifting of control between these two occurs in response to demands such as the fight or flight response. The Sympathetic Nervous System (SNS) prepares the body to react and expend energy in times of stress. When a potentially threatening experience occurs, the body reacts with what has been called the “fight-or-flight” phenomenon. The sympathetic system quickens the heart rate and breathing to increase oxygen, dilates pupils for better vision, reduces digestion to conserve energy, and prepares the muscles of the body to either defend or escape. As is often written in neuroscience and psychology textbooks - it controls the four F’s - fleeing, feeding, fighting and mating. This system is not only active for life-threatening situations; a project deadline or an urgent email might be stressful enough to trigger it. Stress often leads to overactivation of the hypothalamic-pituitary-adrenal axis, the system that controls hormonal contribution to the fight or flight response. The Parasympathetic Nervous System (PSNS) helps the body “rest-and-digest”, conserving energy and maintaining functions under ordinary conditions. It slows the heart rate, stimulates digestion and other metabolic processes. This system is slow acting, unlike its counterpart, and may take several minutes or even longer to get the body back to a relaxed state after a stressful situation. Also known as the afferent (conducting inwards) division, the sensory division receives sensory information from the body and sends it inwards to the CNS. The sensory division uses neuronal cells that have special protein machinery, receptors, that can transduce different kinds of mechanical or electromagnetic energy into a signal. This signal can then be relayed to the cerebral cortex, which has specific areas for processing visual, sensory, auditory, olfactory and taste information. Often times, the signal may travel through the spinal cord along information highways called tracts. Many of these tracts even cross-over, for example the left side of the cortex receives certain sensation from the right side of the body. Also known as the efferent (conducting outwards) division, the motor division receives information from the CNS and sends it out to the body. Often times, these signals will also travel through tracts in the spinal cord, and will connect at neuromuscular junctions - where the end of a neuron meets a muscle. These signals sent from the brain and through the spinal cord can then diffuse out to control muscle movement for arms, legs or even the muscles surrounding organs. Cells that can produce motor changes that influence the movement of the body are also called effectors. The sensory and motor divisions each include a part of the somatic system and the autonomic system. There are also CNS-independent reflexes where a short loop of receptors and effectors work to regulate the body. Below is a diagram showing how signals move through the nervous system. If you would like to learn more about the nervous system there is an excellent video series by Crash Course on the topic.